I have to tell you that printing my own fabric was a blast.. I’ve been planning on doing it forever and finally went for it. There are so many possibilities when you print your own fabric – colors, patterns, shapes and sizes… You can be really creative with this project. And on top of all the design fun stuff, you then get to sew the fabric into something to use on a daily basis. Talk about showcasing your stuff! As noted in my last post, I used a pattern that I bought from Sew LA. They have closed their doors, but the pattern is called ” Box Zip Bag”. 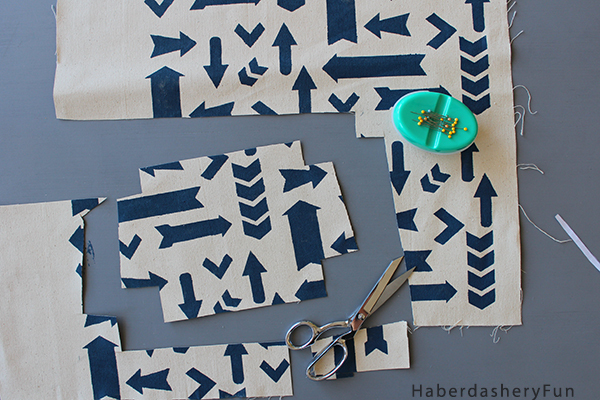 If you want to see the full tutorial on how to print your own fabric click here. 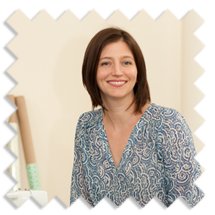 Step 1 – Use your Silhouette machine and create the design. In this case I used Karla Dudley’s “filled arrows” design and added a few more arrows into the mix. I reworked the group until it had a cohesive feel. 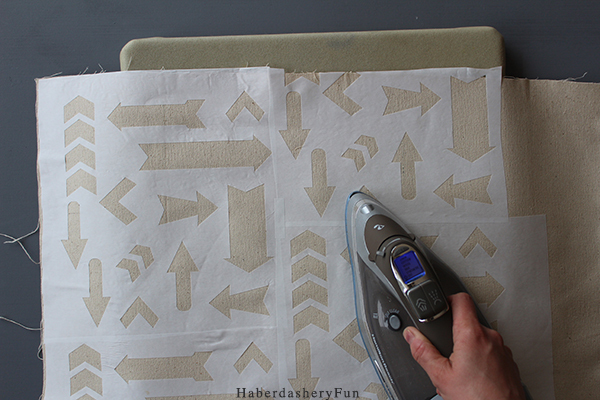 After finalizing the design, place the freezer paper onto the mat and send the file to be cut. Use the tools provided with your machine and gently pull the design away from the mat. After measuring my fabric and figuring out the layout and overall design, I cut 6 pieces of freezer paper to make up the fabric design. 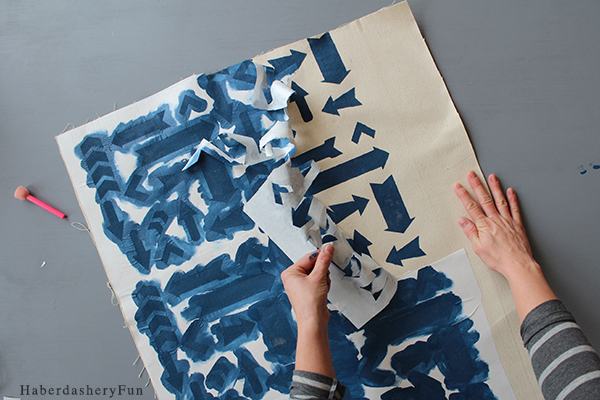 Step 2 – Iron the freezer paper onto the fabric. Start with one column first and then off set the second column and place the freezer paper in the middle of the first column design. This helps break up the pattern. Gently press the freezer paper in place by lifting the iron up and down. Don’t pull the iron around or you risk damaging the cut edges. Step 3 – Squirt a small amount of fabric paint onto a plate, place the sponge into the ink and gently dab onto the fabric surface. Work fast. Do not “pull” the sponge around, just dab lightly. Do not goop the fabric paint.. I find the more you goop the fabric ink, the more it bleeds under the freezer paper! 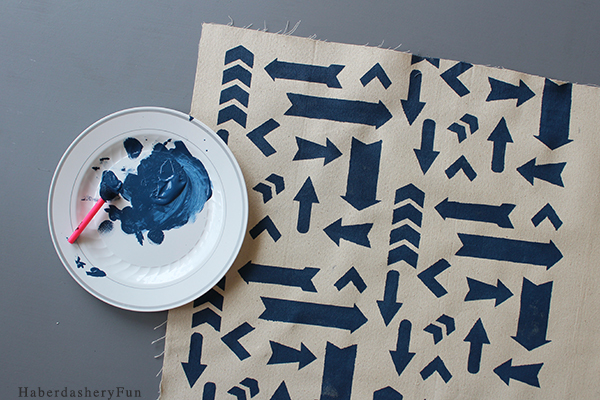 Step 4 – While the fabric paint is still wet, gently pull the freezer paper away from the fabric. Set aside to dry. 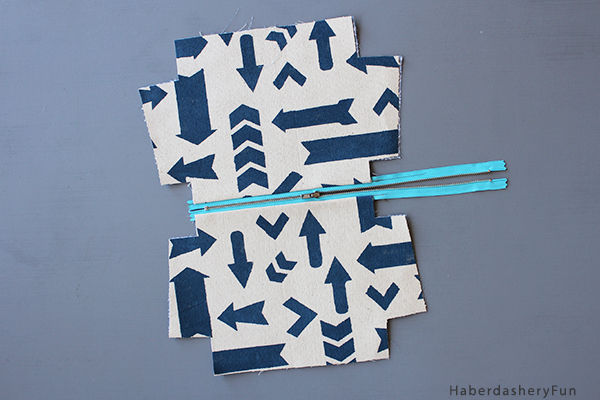 Step 5 – Lay the pattern pieces onto your fabric. Look for areas that have visual interest. 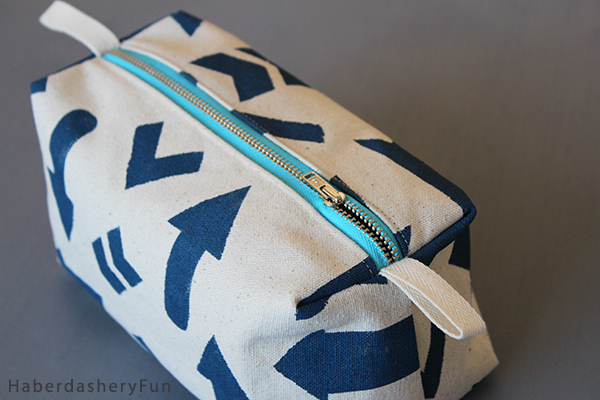 If you want the same print and placement on each side of your pouch, pin the pattern pieces in same design areas. I went for a random look with this pouch, as I really liked different areas of the fabric. 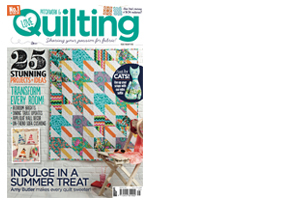 Note – As you pin in place, remember the grainline on the pattern piece and your fabric. 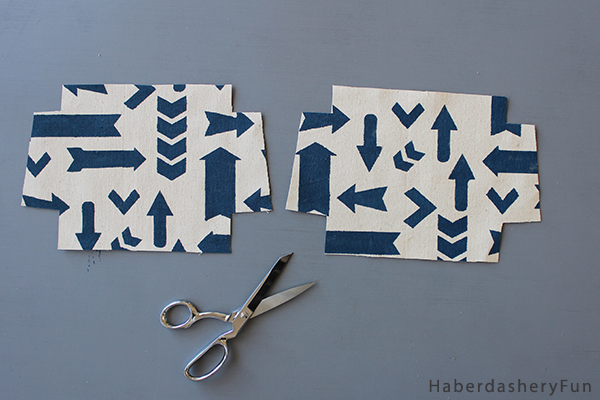 Step 6 – Cut the pieces from your printed fabric. For the outside of the pouch, I only had 2 pattern pieces to cut. Finish cutting the remainder of the pieces – lining, interfacing, etc. 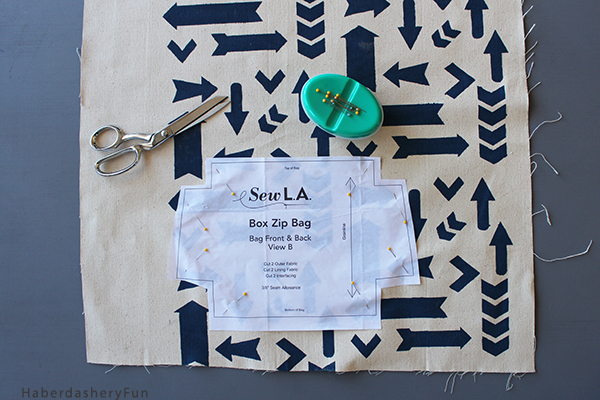 Step 7 – Follow the pattern instructions and sew the pouch together. For good workmanship and construction, remember to press as you go! That’s it! 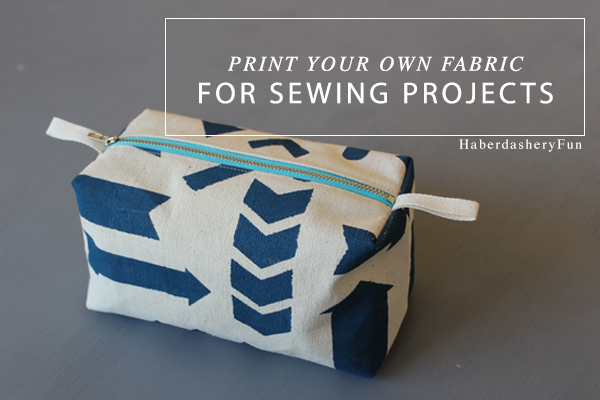 What are your thoughts on printing your own fabric? Plan to make some? If so, what colors, shapes and patterns inspire you? 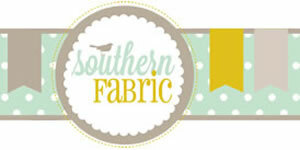 I’m already addicted to printing my own fabric and have so many ideas up my sleeve.. Can’t wait to share! Would you like to see more of my Silhouette ideas and tutorials? 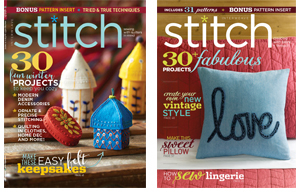 Click the following links for firetruck party favor canvas totes, easy HTV kids birthday T-shirt, holiday inspired printed tea towels and my fabric advent calendar. So creative and such a great idea. I’ve never thought of printing my own fabric. 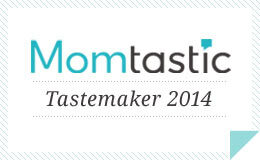 Thanks for sharing – both tutorials make it look so easy. Just saw your other post on the colorful zipper pouch. Arrows are awesome. 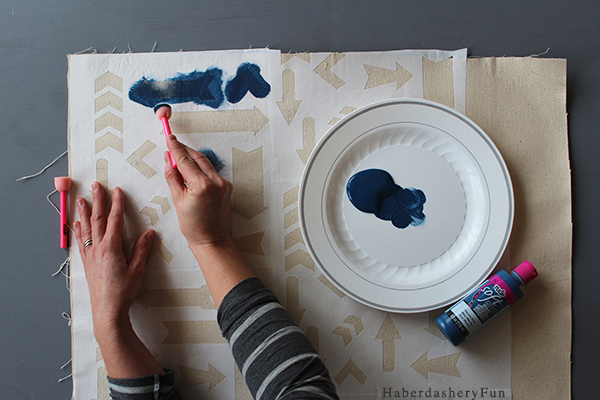 Unique ideas great way to use up the freezer paper. So cute! 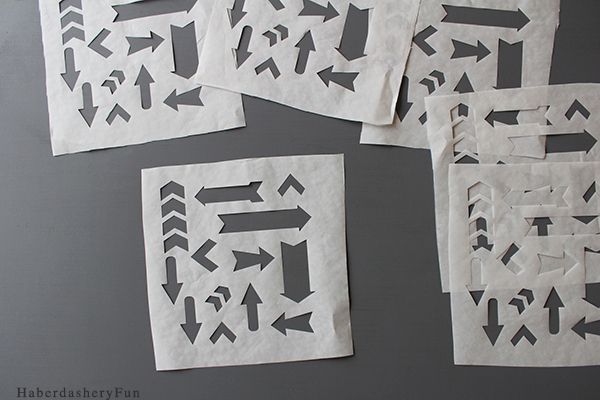 I don’t have a Silhouette machine so I’ll have to print my own fabric the “old fashioned” way by tracing a template! Visiting from Weekend Retreat party. Absolutely love these printing on fabric posts- I’ve been focused on making paper prints for the wall lately and this inspired me to get back into working with fabric:) Thanks for sharing! 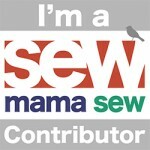 Creative project…Thanks for adding this to the Thursday Favorite Things Blog Hop! Great Job by you Haberdashery, You have done a awesome job. 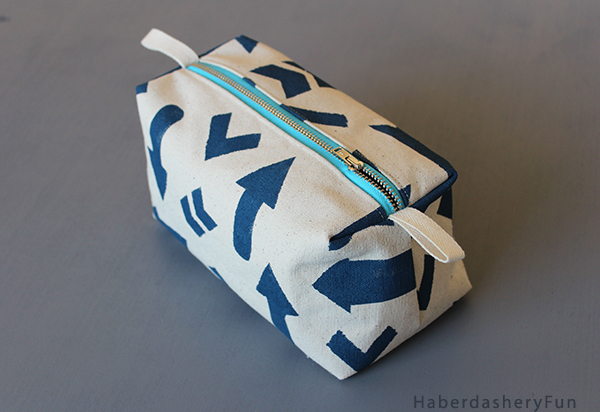 Basically this kind of work is so hard to create awesome print for Sewing a pouch. 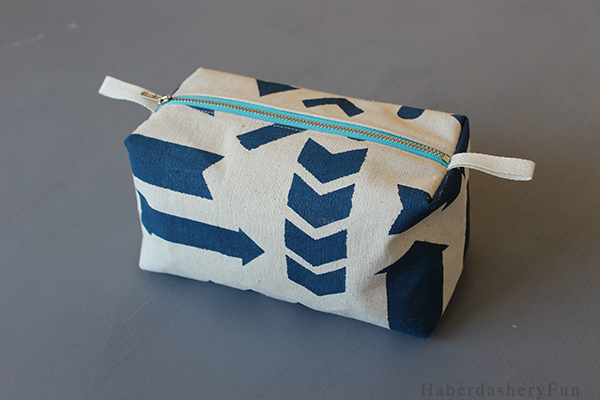 Sewing a pouch looks really amazing & color combination is superb.